Michigan has an abundance of lakes and streams that are not only beautiful, but are perfectly tailored to the wonderful pastime of canoeing and kayaking. Whether you like swift-moving streams with some action, or picturesque ponds and lakes for smooth gliding, you’re sure to find what you’re looking for not far from where you live. 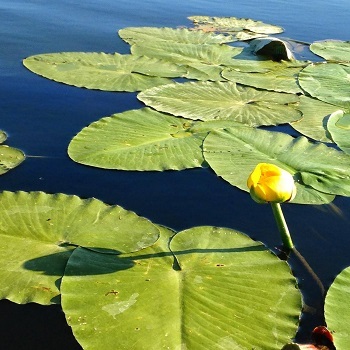 One such place to experience this pastime is in Pentwater, paddling on the forks, estuary, and the head of Pentwater Lake. There are so many options within and surrounding Pentwater to explore nature's beauty, and there's always a place to explore for any paddler's skill level. If you need a break from life, get on the water and relax by listening to the sounds of nature--bird songs, the waves of the water, fish jumping, deer running through the grass. So rent or grab your canoe, kayak, or stand up paddeboard and start exploring! This is an excellent way to experience the varied environments that make up the Pentwater river watershed. Just off of Monroe Road, you can begin your Pentwater River trip at the launch area on the south side of the road just before the Pentwater River Bridge and before the Red Barn. This area has limited parking space with no storage facilities available, although it offers a put-in ramp intp the Pentwater River/State Game Area Estuary. You have an option of traveling south (or right) at the ramp downriver from the confluence of the north branch and south branch of the Pentwater River. From there you can paddle up the south branch turning south (or left) at the fork, or continue out the north branch to the head of Pentwater Lake. If you decide to head up the north branch of the Pentwater river, turning left once you're in the water from Monroe Road, you'll enjoy many turns and curves of a deciduous riparian environment vs. the grassland estuary of the lower north and south branches. All options boast many different species of wildlife. Although some of these options include going up-river, the current isn't usually strong enough to create much difficulty while paddling. Once on the river, there's a feeling of remoteness and seclusion. Tall grass creates a pathway on the river, and there isn't a house or road in site...just nature. White tailed deer, muskrats, fish, different species of birds including bald eagles, and many other forms of wildlife will accompany your trip up the Pentwater River. 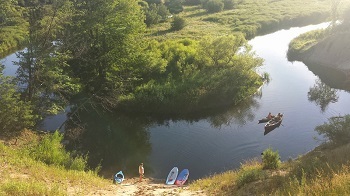 About 45 minutes to an hour paddling upstream on the south branch, you'll see a large sand dune. It's worth the climb to take a break from paddling and take on the 100-plus foot sand dune to catch a view of the winding river and wildlife in the surrounding area. On the way back, enjoy a carefree ride downstream and let the river take you down its course. One of the most beautiful times to go kayaking, canoeing or stand up paddle boarding is early in the morning and later in the evening, sometime during the sunrise or sunset. There is so much history involved with the rivers of Michigan. Way back when, rivers were a major way of transportation, and the people back then traveled by canoe, carrying all their belongings with them while heading to their next location which, many times, was unknown to them. 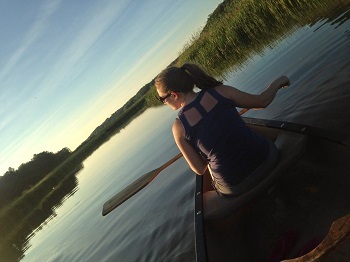 Traveling the river of Pentwater in a canoe, kayak, or upon a stand up, can take you back and will be sure to help relieve some stress from everyday life. Make a day out of it, and travel the river, then head to Pentwater Lake, or just take a couple hours to enjoy your adventure. If you're on the water for a long period of time, be sure to take along some snacks, and water to stay hydrated in the sun. 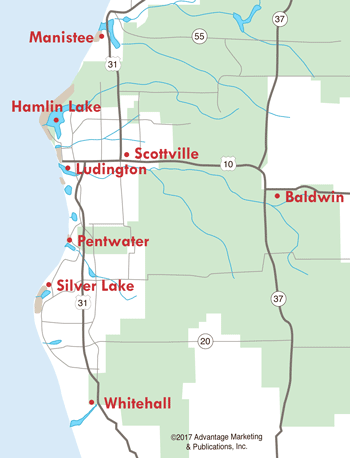 If you're looking for a bigger area to explore, check out the Pentwater Lake, or even Lake Michigan from the Charles Mears State Park. There are several different places to start from when exploring the lakes. In downtown Pentwater, from the launch area at the South end of the Village Marina near Snug Harbor there is a small launch area. Parking is available at the marina. You can grab some lunch downtown, then head to the launch to get on the lake and start exploring. Another place to drop in is on Longbridge Road, just outside the Pentwater city limits. From the launch area on Longbridge road (south side of the Pentwater Lake at the 90 degree bend) there is a wide launch area with a dock. Limited parking is available. Once on the lake, enjoy the view of open water, and travel near the shore to get a different view of Pentwater houses and roads.